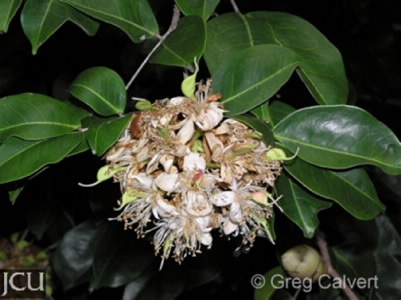 This tree, a native of North Queensland and New Guinea has compound leaves with 2-4 pairs of leaflets. 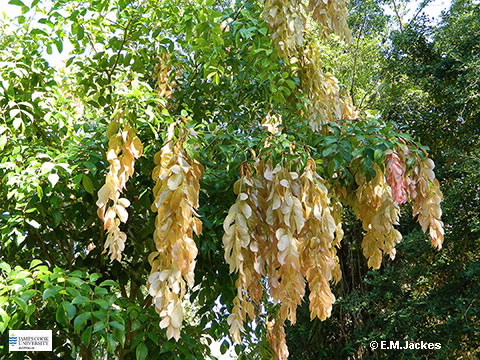 Flushes of new foliage form pendent clusters of pale pink to pale green leaves emerging from the rusty-coloured scales of the buds. Flowers white in clusters, stamens long and exserted. Pods to 2-5 cm long, to 3 cm wide, somewhat flattened on the side, turgid, beaked, 1-2-seeded.